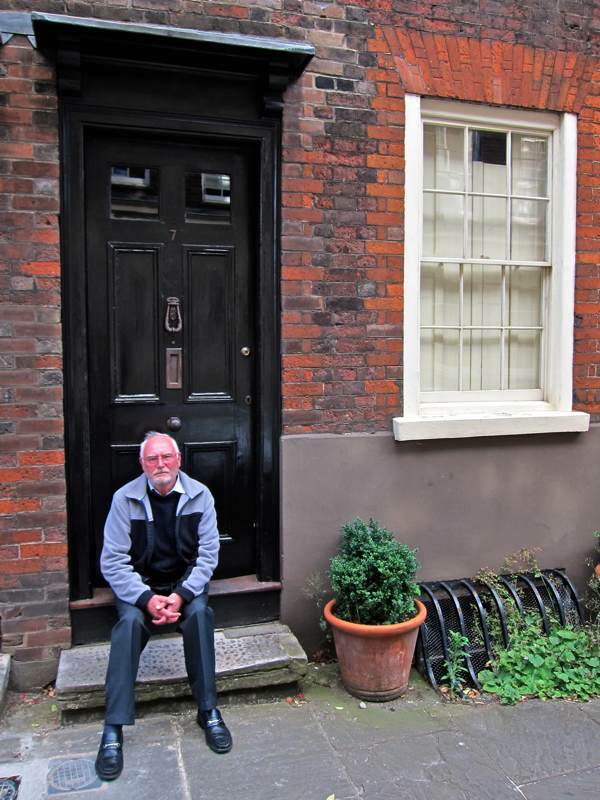 This is Neville Turner sitting on the step of number seven Elder St, just as he used to when he was growing up in this house in the nineteen forties and fifties. Once upon a time, young Neville carved his name upon a brick on the left hand side of the door, but that has been removed and replaced now that these are prized houses of historic importance. When Neville lived here, the landlords did no maintenance and the building was dilapidated. But Neville’s Uncle Arthur wallpapered the living room with attractive wisteria wallpaper, which became the background to the happy family life they all enjoyed, in the midst of the close-knit community in Elder St during the war and afterwards. 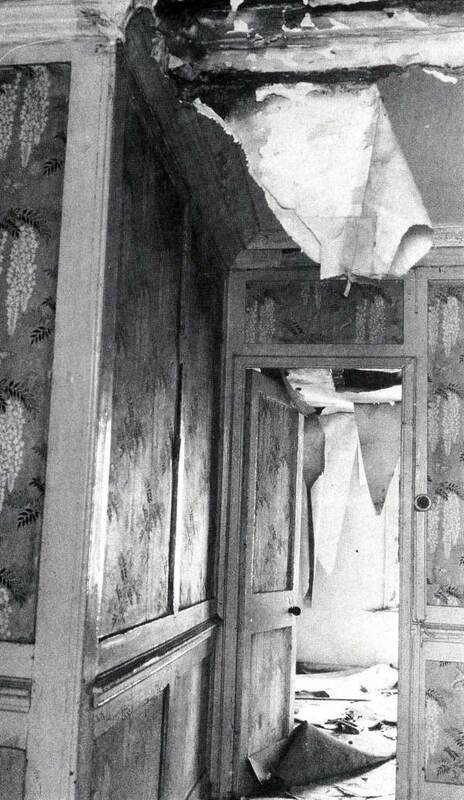 Subsequently, the same wisteria wallpaper appeared as a symbol of decay, hanging off the wall, in photographs taken to illustrate the dereliction of Elder St when members of the Spitalfields Trust squatted it to save the eighteenth century houses from demolition. It was only when an artist appeared – one Sunday morning in Neville’s childhood – sketching the pair of weaver’s houses at number five and seven, that Neville became aware that he was growing up in a dwelling of historic importance. Yet to this day, Neville protests he carries no sentiment about old houses. “This affection for the Dickensian past is no substitute for hot and cold running water,” he admitted to me frankly, explaining that the family had to go the bathhouse in Goulston St each week when he lived in Elder St. However, in spite of his declaration, it soon became apparent that this building retains a deep personal significance for Neville on account of the emotional history it contains, as he revealed to me when he returned to Spitalfields this week. 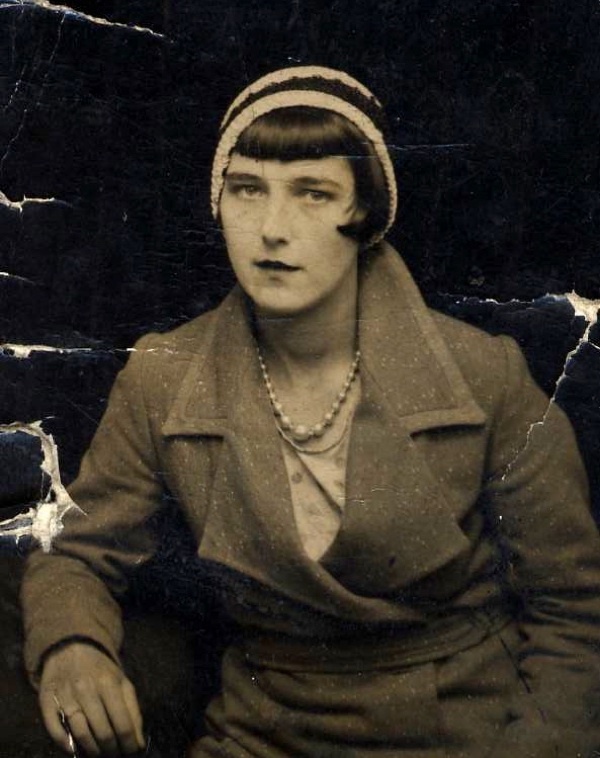 “My parents moved from Lambeth into number seven Elder St in 1931 and lived there until they were rehoused in 1974. The roof leaked and the landlords let these houses fall into disrepair, I think they wanted the plots for redevelopment. But then, after my parents were rehoused in Bethnal Green, the Spitalfields Trust took them over in 1977. I was born in 1939 just before the war began and my mother called me Neville after Neville Chamberlain, who she saw as the bringer of peace. I got a lot of stick for that at school. 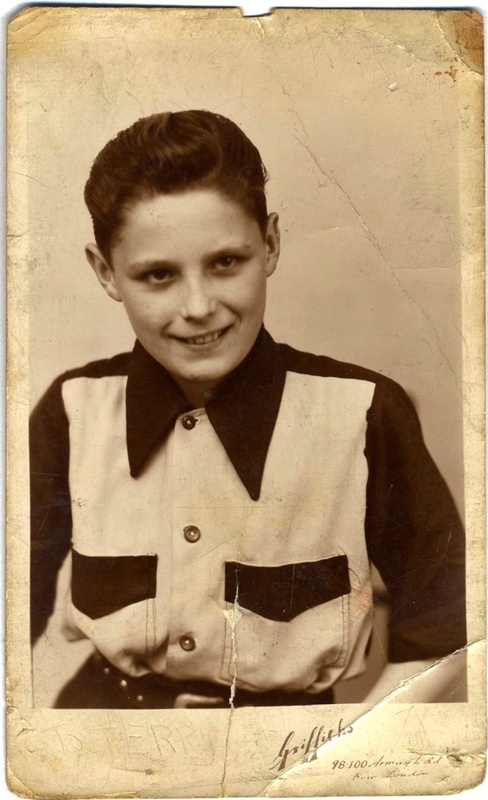 I had two elder brothers, Terry born in 1932 and Douglas born in 1936. My father was a firefighter and consequently we saw a lot of him. I felt quite well off, I never felt deprived. In the house, there was a total of six rooms plus a basement and an outside basement, and we lived in four rooms on the ground floor and on the first floor, and there was a docker and his wife who lived up on the top floor. My earliest memory is of the basements of Elder St being reinforced as air raid shelters in case the buildings collapsed – and of going down there when the sirens sounded. Even people passing in the street took shelter there. Pedlars and knife-grinders, they would bang on the door and come on down to the basement. That was normal, we were all part and parcel of the same lot. I recall the searchlights, I found it interesting and I wondered what all the excitement was about. War seemed quite mad to me and, when it ended, I remember the street party with bonfires at each end of the street and everybody overjoyed, but I couldn’t understand why they were all so happy. None of the houses in Elder St were damaged. We used to play out in the street, games like Hopscotch and Tin Can Copper. All the houses had a door where you could go up onto the roof and it was normal for people in the terrace to walk along the roof, visiting each other. You’d be sitting in your living room and there’d be a knock on the window from above, and it was your neighbours coming down the stairs. As children, we used to go wandering in the City of London, and I remember seeing typists typing and thinking that they did not actually make anything and wondering, ‘Who makes the cornflakes?’ Across Commercial St, it was all manufacturing, clothing, leather and some shoemaking – quite a contrast. 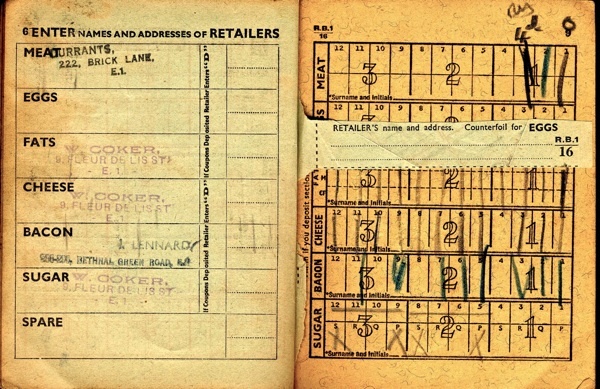 After the war, my father worked as a bookie’s runner in the Spitalfields Market, where the porters and traders were keen gamblers, and he operated from the Starting Price Office in Brushfield St. He never got up before ten but he worked late. They were not allowed to function legally and the police would often take them in for a charge – the betting slips had to be hidden if the police came round. At some parts of the year, we were well off but other parts were call the ‘Kipper Season’ which was when the horse-racing stopped and the show-jumping began, then we had very little. I knew this because my pocket money vanished. I joined the Vallance Youth Club in Chicksand St run by Mickey Davis. He was only four foot tall but he was quite a strong character. 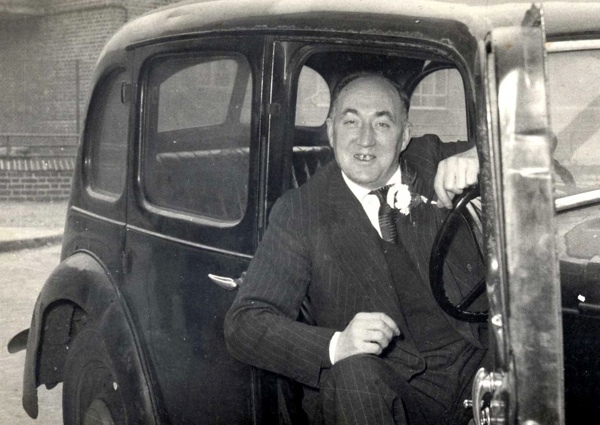 He was attacked a few times in the street on account of being short and a few of us used to call up to his flat above the Fruit & Wool Exchange, so that he could walk with us to the club, but then he got ill and died. Tom Darby and Ashel Collis took over running the club, one was a silversmith and the other was a passer in the tailoring trade. We did boxing, table tennis and football, and they took us camping to Abridge in Essex. We got a bus all the way there and it only cost sixpence. 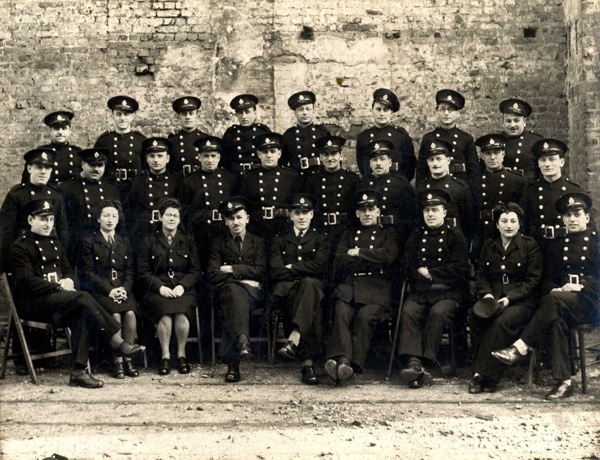 Neville’s father Charles Turner was in the fire service during the war (fourth from left in back row). 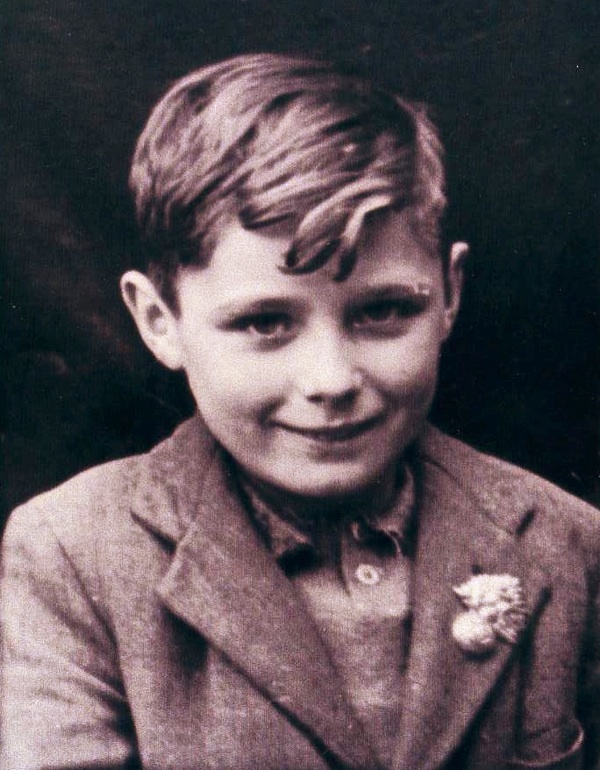 Neville aged eleven in 1951, photographed by Griffiths of Bethnal Green. 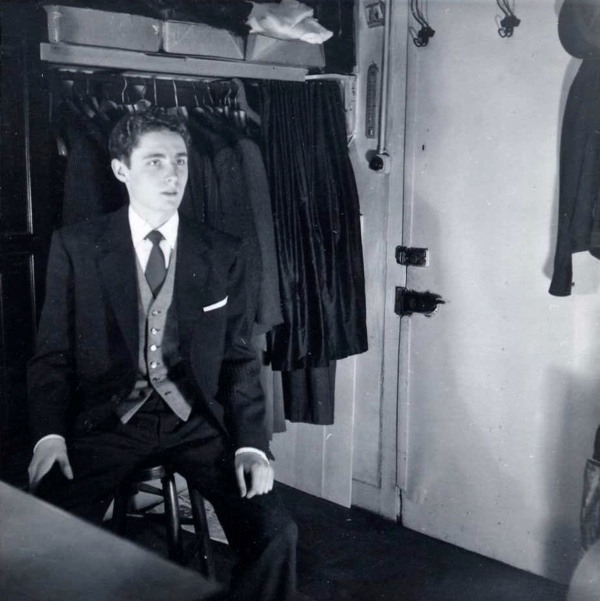 Neville at Saville Row when he began his career as a pattern cutter at sixteen. 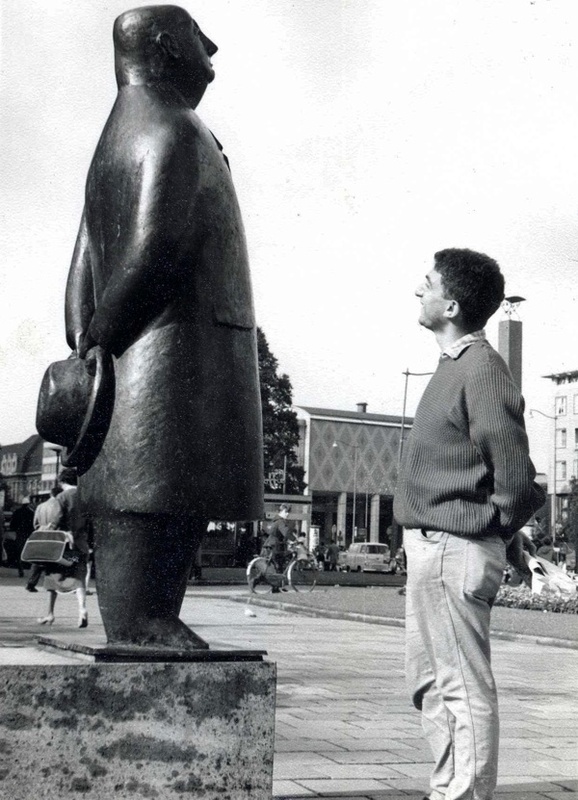 Neville’s friend Aubrey Silkoff, photographed when they hitched to Amsterdam in 1961. 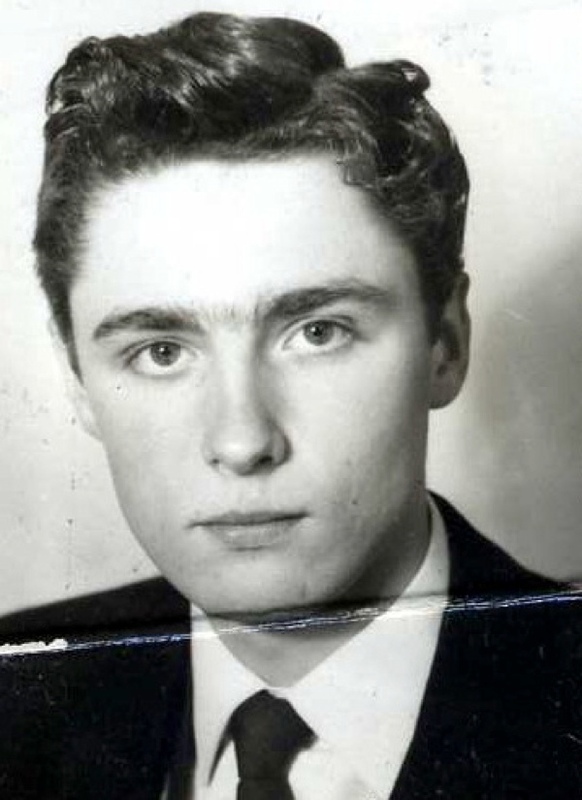 Neville as a young man. 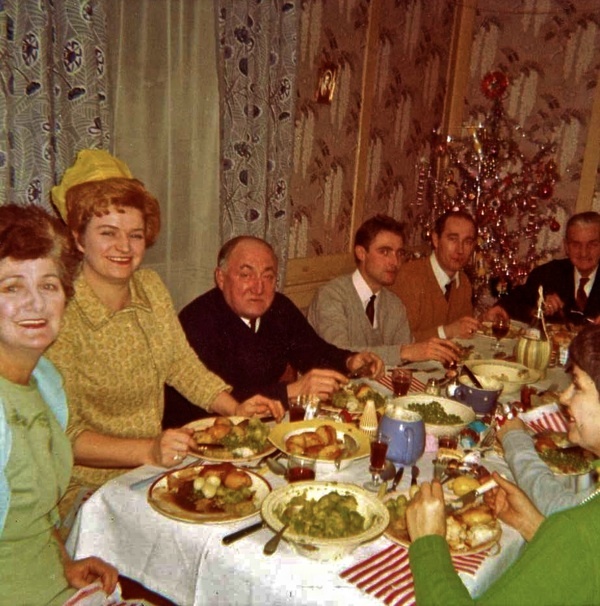 A family Christmas in Elder St, 1968 – Neville sits next to his father at the dinner table. 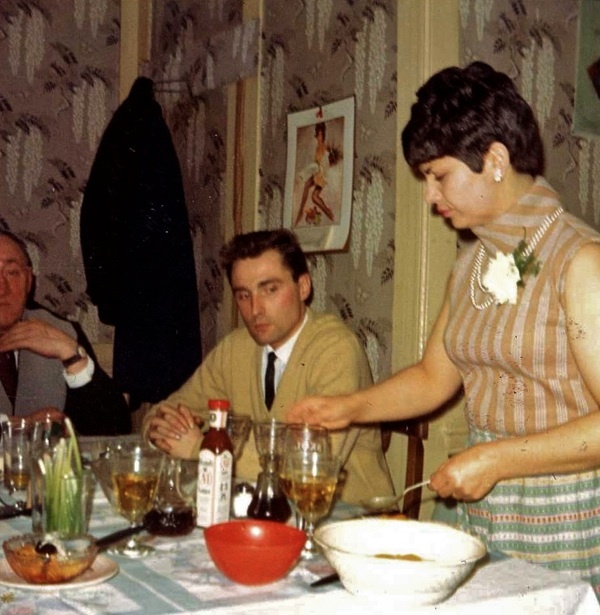 Neville, Margaret and their son Minas. 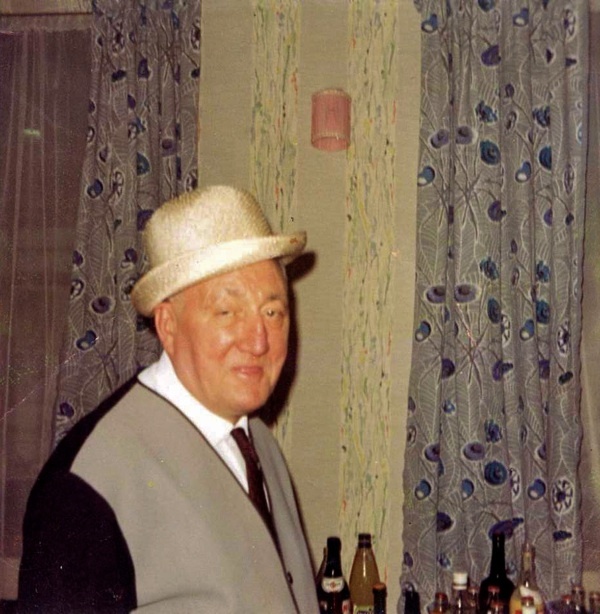 Neville’s Uncle Arthur who hung the wisteria wallpaper. The living room of number seven photographed by the Spitalfields Trust in 1977 with Uncle Arthur’s wisteria wallpaper hanging off the walls. 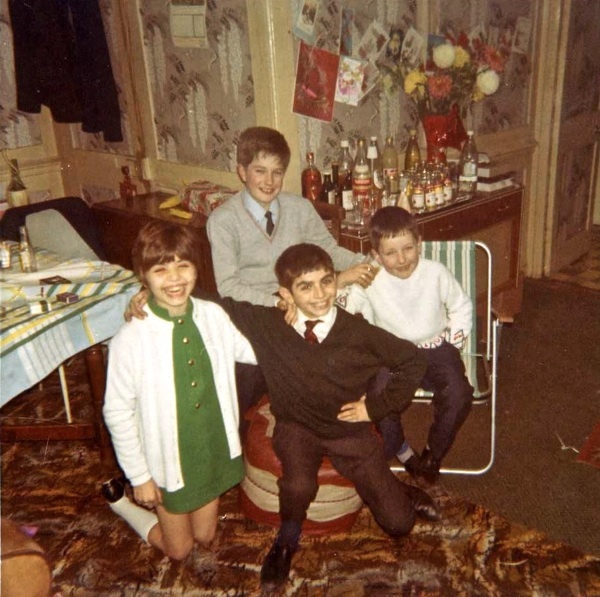 Dan Cruickshank and others staged a sit-in at number seven to save the house from demolition in 1977. 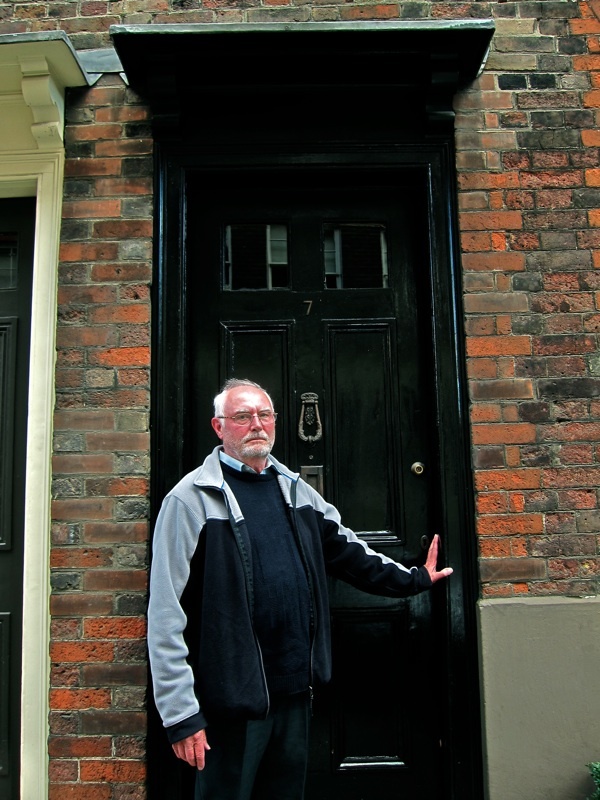 Neville Turner outside number seven Elder St where he grew up. They aren’t still available are they, 5 and 7, at eighteen hundred? I only ask because i reckon i could rustle that up if i ask around. Mr. Turner’s mother was an absolute beauty. Very nice article. GA, thanks for sharing Neville’s life story. Those are great Christmas pics with the Brussell sprouts featured prominently on the holiday table. So glad that #7 survived. 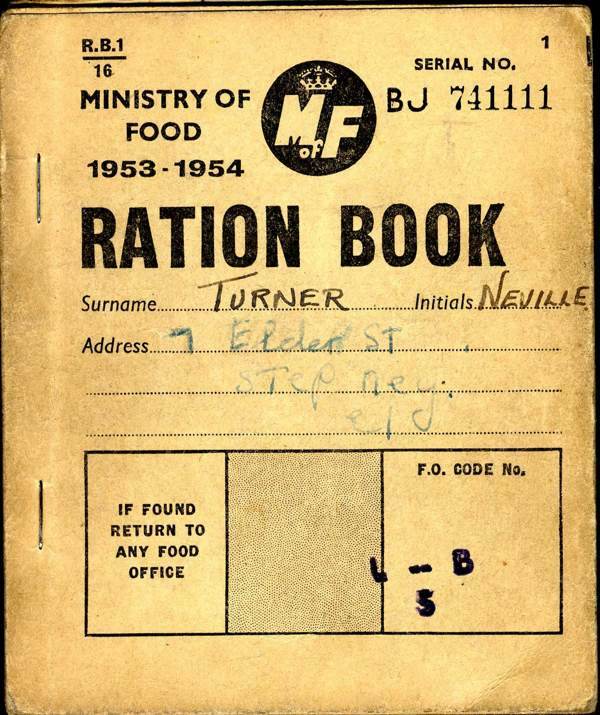 I notice that in the image “Neville as a schoolboy” he’s wearing a Royal Fusiliers badge in his lapel. Was a family member in the 1st. Battalion (London Regiment) Royal Fusiliers? They’re based at the Tower of London and it would have been the local regiment. My dad volunteered there for the Great War. Thank you both for this riveting history. I know the area and the streets so well although my childhood was in Stoke Newington and Clapton. Neville’s story has a common thread for many Londoner’s like myself who never had a bathroom with hot running water. 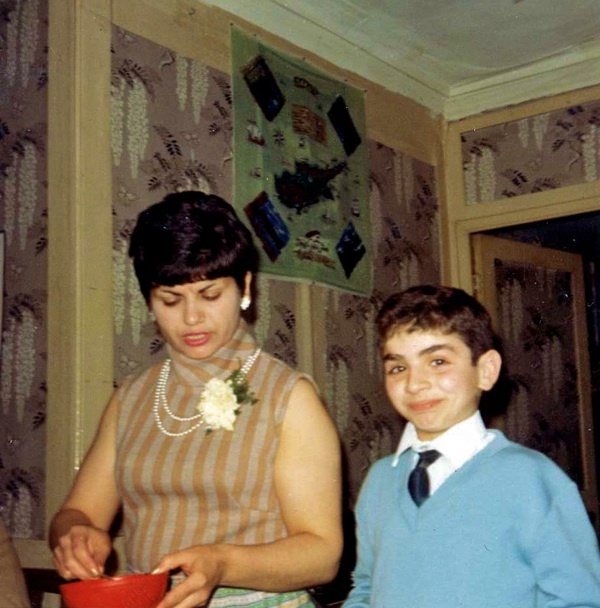 I can recall my mother washing me in the kitchen sink standing in a tub. Oh the day we moved and had hot water coming coming from the tap !! You don’t know what ecstasy is until you don’t have to fill a tin bath without boiling 10 kettles on the stove, one after the other. As already said, another great story. I must say that Neville has aged well, and I certainly hope I look that good if I’m lucky enough to reach 80! Just out of interest, I wonder what those houses are worth now? It does show the importance of saving select slices of history though, so well done all who did. I also wonder what the houses look like inside now? Ah! Brand’s A1 Sauce. Only a week or two since I remembered it; a nice change from HP (which I am sure tastes nothing like it did when I was a boy!). I have not seen A1 on the grocer’s shelves for many a year, alas! Another slice of life that make you hunger for more! I would like to know more about his wife, Margaret and son, Minas- Neville Turner part two please! 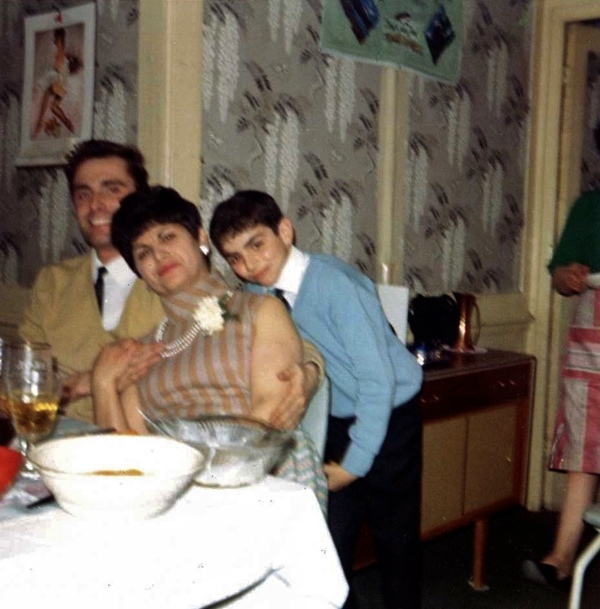 Thank you Neville for sharing your heart warming story of East End family life, especially the Christmas photos with all the generations squeezed around the table and plenty of food. …..not forgetting the ‘mini bar’ on the sideboard for Christmas cheer, happy memories. I also have a few childhood photos taken at Griffiths of Armagh Road as do many Eastenders I’m sure. Neville’s mum was just great. She always welcomed me whenever I called and, more, I was always offered food or even a proper meal. I remember a long conversation with her (can’t remember the subject) when Neville wasn’t there; she leaning out of the first floor window and me, standing out on the pavement beneath, and peering up at her. 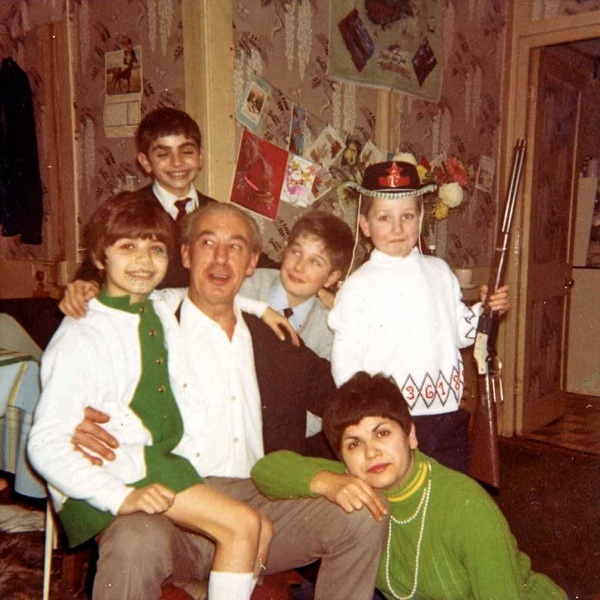 Always fascinating to read about real London lives, especially when accompanied by such great family photos. And thank goodness Dan and his gang saved the houses from demolition. It must break their hearts to see what is happening at the other end of Elder Street at Norton Folgate – grrrr!! 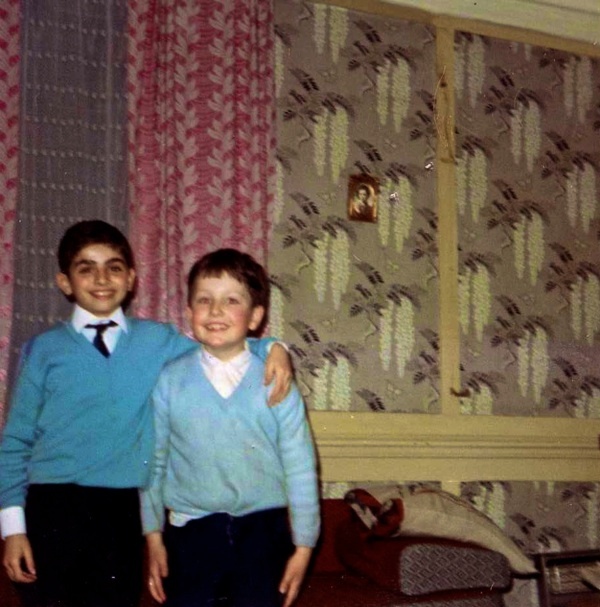 I lived at 20 Elder Street from 1953-1958 when we were evicted by our landlord. My mother and sister moved to Stoke Newington. I have lived in the US since 1964, but have been back to Elder Street a few times. The last time was in 2017. I was pleased to see how the street has been preserved and, of course, cleaned up. Only millionaires can afford to live there now. No. 20 has been knocked down at least twice. It has been offices and is now living accommodation again. The whole area certainly is very upmarket and nothing like it was when we lived there. I was one of the children playing in the street and may have played with the author or, at least, have seen him. 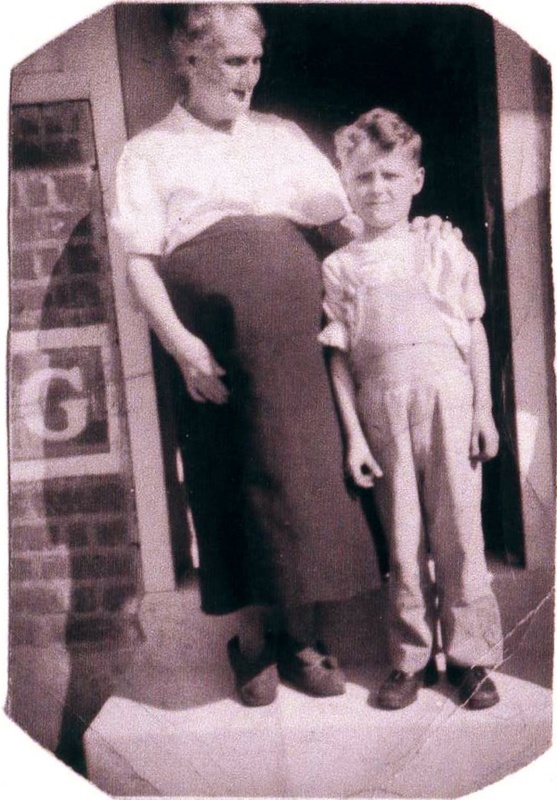 We lived in the house that had a bathroom since the builder of some of the houses had lived there – 100 years before – and wanted the best for himself with servants quarters in the basement. There were intercom tubes set up and my sister and I used to play with them by whistling into the tubes and calling to each other. The house was not in good shape, but we did our best to keep it livable. As you mentioned, the landlord did nothing and we did all our own painting and repairs.